Each day that we awaken is certainly a glorious and a blessed day, given to us by the Lord our Father. My passion for each day and the wonders it brings is sometimes insurmountable. Often, it’s the simple things that radiate such joy through my heart. The sun peaking above the horizon, the branches of the trees swaying in the gentle morning breeze, watching my daughter sleep for she so looks like an angel and the nectar sweet taste of my breakfast, usually melon and a slice of spouted bread. I cannot imagine what more a person could ask for. One might ask, “Why so content?” Especially when so many do not feel peace in their hearts. My answer: I am lucky and I am blessed by God. My life experienced radical changes 6 years ago when one of the Lord’s messengers reached out to me. At a late age (it is never to late) I was saved. Through my salvation, I came to realize that the written word empowers us with everything we require in order to live a fruitful, gracious, peaceful and spiritual life. I have worked within the confines of allopathic health care for over 17 years. My background includes neuro-rehab services in the areas of spinal cord injuries, strokes, and traumatic brain injuries. I have worked adult acute psychiatric care, special education services, and autistic child services. I have worked with cancer patients in rehab services and with those suffering Parkinson’s disease, Huntington’s Korea and Dementia. I have worked with doctors, nurses, and other specialists who were absolutely brilliant, compassionate, and absolute masters in their fields. I have worked with the same, who were not so bright and possessed not one ounce of compassion. All the time doing my best to make sure that my patients received the very best of care, the care they deserved and as taught to me during so many years of University. However, despite my best efforts, I never really felt I was making the difference I had set out to do so early in life. Many of my patients were still sick or ailing, not making the strides, leaps, and bounds I had envisioned for them. While I was at a loss as to why, I came to find many years later that the Lord was not lost at all. God knew all. Unfortunately, I was neither intimate nor familiar with His word, wishes, and teachings. Therefore, I was limited as to what I could do for those in my care. I was also limited as to what I could do for myself and my family. At the beginning of every year, my fellow parishioners (or should I say those who are willing to do so) take 3 weeks to fast for 21 days. The Daniel Fast they say. By fasting, it is meant that for 3 weeks nothing is consumed but water, fruits, vegetables, legumes, and juices. For those that feel really “tough”, and so inclined to do so, they will consume only fluids for the 3 weeks. During this time, the lists of taboo foods include any and ALL meat products, ALL sugar products, ALL fast food products, and ALL processed food products. I did not partake in the Daniel Fast festivities even though I was a newly saved child of God. It really did sound particularly yucky to me. I decided to sit back and simply watch these folks who had destined themselves to eating sticks and roots for the next 21 days. After church that day, I went to my favorite ice cream shop and had a double chili dog topped off with a hot fudge sundae. I felt happy and quite satiated that day compared to my poor friends who were off to a meal of sprouts and lettuce. “No thank-you” I thought. I did not expect that the Daniel Fast festivities would be that big a deal. But oh it was. By day 3-4, many began complaining of feeling light headed, dizzy and nauseated. Some of the most steadfast parishioners, those who never missed a service or a meeting, all of a sudden felt so badly that they had to stay home for a few days to rest. My silent thoughts were to tell them to “just go grab a burger and feel better”. This early phenomenon of “suffering” was my introduction to the concept of detoxification. Around days 5-7 I noticed that my fellow Christians had begun huddling in almost clique type groups. They shared giggles, silent whispers, knowing looks and sometimes uncontrollable laughter. What was the big secret? A couple of these groups finally “let me in” and told me what all the giggles were about. Some of these people were absolutely amazed at the bowel contents found in their toilets. There was a hint of pride as each freely shared, without shame or embarrassment, the size, color, shape, amount and frequency of their bowel movements. Some described deposits that had never been seen before, almost like some blob you would find in a science fiction horror movie. Interestingly, some of these folks were beginning to feel considerably better at this point, while a few suffered such severe constipation that it was painful and at times almost crippling. This was my introduction to the concept of colon cleansing. The fast was also a time for “extra fellowship” as I called it. The ladies would get together and share their best recipes for raw foods, salads, steamed vegetables and the like. They shared tips and tricks for satisfying the stomachs of grumpy fasting husbands and whining children who could not figure out why they had not been to a fast food restaurant in over a week. Parishioners invited each other to their homes for dinner and shared with each other how they took cabbage, sprouts and beans and turned them into meals fit for kings. I was invited to a couple of these dinners. Even though I was not fasting, I went anyway. I looked at the dinner table decorated in bleak offerings and thought to myself, “Okay, where are the french fries, I need steak, and cheesecake covered in chocolate sauce for dessert please.” I politely ate my dinner, fit for a rabbit I thought, and raced to grab a double cheeseburger soon after. I secretly felt sorry for those who were fasting. Three weeks was a long time to chew on shrubs. Around day 15, something started just gnawing at my brain. My clinical self began working at the speed of light as I started to note a marked difference in the health and stature of some of these people. One of my favorite ladies, suffering from osteoarthritis and on a steady diet of pain pills, seemed to just glide into service one night. I noticed she literally forgot to bring her walking stick, which was usually dutifully planted by her side. One of the gals, a busy and tired mom, commented on how well she was sleeping and enjoying her excess bursts of energy. A dangerously diabetic fellow had cut his use of insulin in half. Some of the kids, labeled hyper and otherwise ADHD, had started to show signs of settling and appeared much more relaxed. That entire day, almost everyone who was fasting received my solid and silent clinical examination. I was intrigued by the results and somewhat puzzled. Some of these folks were achieving a body balance and equilibrium they had not seen in a long time. It seemed quite obvious to me that many were in the initial stages of healing from what had plagued them. Some of them just looked happier, brighter, revitalized. I remained my miserable self. At this point, some of my fellow parishioners were on a countdown. Happily marking their calendars and anxiously awaiting day 21, when their fast would soon be over. Hmmm … interesting thought patterns indeed. Why? Why change what was suddenly making you feel so well? I was especially concerned about our severe diabetic who had cut his use of insulin in half. It was difficult for me to believe that he was counting down to the day where he then could embark on the pre-fasting habits that were quickly killing him and conjoining him with an umbilical cord to his doctors office. At this point, I began to appreciate and embrace the many changes I had witnessed in the past 2 ½ weeks. My mind was racing as I tried to figure out ways to encourage these people to continue onwards with God’s lifestyle, the life He meant for them to have and not treat this experience as a short 21 day “sacrifice” in the name of the Lord. These thoughts coming from a person who lived on burgers, tacos, soda, and french fries. However, I was still in the mind frame, with regards to myself, that I really did not need to fast. I was young and healthy as a horse. Not to worry. I took plenty of vitamin supplements to insure my good health. I rode horses and jogged. My weight was normal and my physique muscular. Little did I know that my thoughts, habits and actions would change much sooner than later. Day 21 soon arrived. I was shocked when our pastor announced the fast was over. Hooray, Amen, and Halleluiah everyone shouted. Huh? Why were these good people shouting for joy? The fast was making a marked difference in many of them. To celebrate the end of the fast, there was pizza and lots of other “goodies” in the lounge to be enjoyed and gorged upon by all. I was horrified as I watched my diabetic friend eat slice after slice of pizza. He topped off his pizza dinner with a mound of cinnamon rolls, lovingly made by the best pastry cook in the church. I watched some of the kids who had been doing so well, gorging themselves on dishes of ice cream that had been sprinkled with candies and buried in whipped cream. All of a sudden, what had been normal to me and most of us living an American life had become an absolute horror. It was like watching a monster movie in slow motion, with the wicked creatures being sugar, food dyes, processed meats and the like. Somehow, this day was indeed a sad one for me. In the same breath, it was also a day of glory. I realized that God had given me the answers I had been looking for all of these years. I had the answers as to how to help my patients heal, regain function and live a better quality of life. Even those who were limited by a loss of function due to an accident or a stroke could still reap marked benefits within their own confines. The part that saddened me most was that the answers had always been there, I just hadn’t known where to look. About two weeks later, I was diagnosed with cervical cancer. My good friend and excellent gynecologist wished to perform surgery. My mind kept wandering to the Daniel Fast. I started my own Daniel Fast that day. In fact, ever since that day, I have been on the “Daniel Fast”. It has been 6 years now that I have been “Daniel Fasting”. I do not consume meat or it’s by products. I do not consume sugar or processed foods. Where I drank at least 6 cans of soda per day, I now drink just as much water, sometimes with a bit of lemon and/or lime. My plate is full of leafy greens and succulent delicious fruits. I enjoy a myriad of delicious herbal teas. I love home made rolls, crackers and pasta made from my bags of organic oat and spelt flours. Nuts and seeds are a most delicious snack. I take whole food liquid vitamins and a few other supplements in their whole food forms to assist me in my quest to stay healthy, especially when life is just so busy that I literally forget to eat. I did not require surgery during my cervical cancer ordeal and my health has never been better. On the other hand, my own biological family is plagued with health issues such as diabetes, heart disease, obesity, high blood pressure, arthritis and high cholesterol. As the old saying goes, “The plumber’s sink is always broken.” Because I choose to care for my body God’s way, I suffer none of the above. Can life really be so simple? I am here to tell you, yes it is. Our Father, through the Written Word, has given us everything we require in order to live solid, peaceful, productive and healthy lives. In my heart of hearts, I do not believe for one moment that God intended for us to experience prolonged physical suffering of any sort. If that were the case, he would not have been so specific as to what he provided us with in order to assist us with the prosperity of our physical bodies. Allow me to support my position with few quotes from the Written Word. In those days, I was mourning 3 full weeks, I ate no pleasant food, no meat or wine came into my mouth, nor did I anoint myself at all, till 3 whole weeks were fulfilled. Daniel 10:32, 3. In other words, Daniel gave up certain foods in order to honor God. He was fasting from foods that would defile his body. In fasting Daniel honored God with his body, mind, and soul. How can things be stated more clearly? 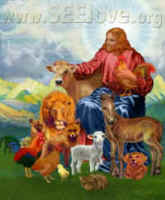 God says nothing here about artificial food colorings, animal products and artificial fats! He is quite clear about fruits, grains and vegetables. With all due respect to modern day science, of which I am a product and student, these people over 2 thousand years ago, did not require the latest research in order to determine what was healthy for them, their spirits and their bodies. After all, it is written in The Word. Point very clear and well taken. Unfortunately, (or I guess that really depends on one’s viewpoint) after being so touched by The Word and its simplicity, I found I had to educate myself once more. I had to go to school again to get the right piece of paper so that I can now “legally” tell people to eat their fruits and vegetables. (SIGH) However, it has been worth every twist and turn in my oftentimes bumpy road. I now have a private practice, own a laboratory and have the burning passion to share God’s word with as many as I am physically and spiritually able to reach. Oh how He changed my life, through so many of his messengers here on earth. I can only hope I am worthy enough to help deliver the same message of love and salvation to others.